My body is (still) sore but happy that I more than survived the weekend! It was an AMAZING experience driving up to Hainsport, New Jersey to see the first ever National Ninja League Finals! I did a very quick update on Day 1. I'm doing the same today just doing a quick update. I have a bunch of footage and several hundred photos that hubby and I took over the weekend. First of all I wanted to thank Chris Wilczewski and his staff /volunteers at Movement Lab for running a really tight ship. I've been to a lot of competitions in other sports in my day but this was on time and run smoothly. I'm sure there were hiccups here and there (every event has them) but it was not clearly visible to the audience. They had to deal with a max capacity for both days and they managed to keep the competition moving and always engaged the audience so they knew what was going on. I'm so proud that the first event focus was on the competitors and not any organizational problems. That usually plagues other events and it didn't with this one. I was so happy and the crowd enjoyed it as well. The transformation between days was amazing. After the long first day of 170+ runs they immediately packed up the First Stage and went to work on building Stage Two and Three. I was a zombie getting back home. I can't imaging how hard they had to work at night to get all that ready in the morning. Chris told me that they have been practicing for months so the transition was actually pretty smooth. Their staff and volunteers quickly made the transition pretty quickly. I'm told only a couple hours. I'm so happy that William was able to secure some interviews for his website. We'll have snippets of it for future episodes of our Final Stage Podcasts and full interviews up on his YouTube channel. I'll have my own videos (just runs and general stuff) on my YouTube when I get a chance. I also wanted to thank all of the ANW guys who were so warm to me. Seriously. It was one of the most moving things in my life. I've been through a lot on my own (as I like calling my previous life before Sasuke/Ninja Warrior) and to walk into a place I was expecting hostility and getting the COMPLETE opposite was an emotional experience. They knew who I was (and probably knew of my issues with the format of the show and ANW) but they were really nice to me. A lot came up to me (fans and competitors alike!) to introduce themselves! I got a lot of hugs from longtime ANW vets that I finally had a chance to meet them for the very first time. People like Luis Moço, Michelle Warnky, Mike Bernardo, Ryan Stratis, James McGrath, Geoff Britten, Travis Rosen, seriously the list goes on and on. I never felt so loved in an environment that honestly.. I wasn't sure how I was going to be received. Boy was I surprised. I'm so happy I was wrong to be worried. The Sasuke Spirit still lives on in the hearts of the competitors even if the show is gone here in the USA. I was reminded of that. It was also awesome fun talking "old Sasuke" and discussing it's future here in the USA. Sad thought but it was still fun to talk about it. I got in first that morning. LOL! There was only 1 staff member when I arrived but quickly the zombie competitors got in. Many where here past midnight and we they were (mostly) in by 10 AM. Some came running in just in time for the walk-through and you can tell they really needed at least a couple more hours of sleep! I swear some of them were still sleep walking and some I'm not sure knew where they were. I know a few of them didn't even get to sleep yet! LOL Still though when they were on the start line their eyes came to life and they gave it their all. That's some serious adrenaline! The gym got packed in reaaaaaaaally fast. Hubby and I were worried that it was going to be a light crowd since when we got there just an hour before there was no life outside! We went in to a quiet gym with a few ninjas here and there trying desperately to wake up during their stretching/warm-ups. I turned around at one point and the door opened to see a FLOOD of people packing the rafters! I had to move into the competitor pit to get my video. Hubby helped with my iPhone to take photos. Never had I felt so woefully unprepared to document such an amazing competition. I have to find a way to correct that.. I'll do a full rundown with photos and videos of the competition but it was a ridiculous display of talent. 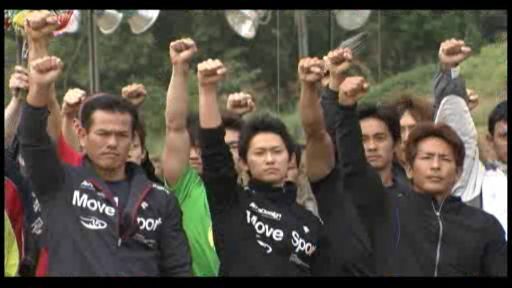 Some ANW and Sasuke vets, some brand new hopefuls that are years from ever making it into ANW. The course was wicked and the time was strict. I thought the First Stage was hard.. but OMG the Second Stage was CRAZY! The competition was AMAZING. Just like any other Ninja event you had some huge surprises, outstanding performances and crushing disappointments. They took it seriously and went all out. The crowd, as was I, were extremely lucky to be able to see such high caliber performances. One neat thing at the end of the competition was that any of the competitors (they had white wristbands) were allowed to try out the course in full. It is a gym after all and it was really cool seeing athletes who didn't get to the Second and Third Stages try out obstacles they wouldn't normally get access to. We saw a slew of high ranked Females tackling a 14 foot wall (and clearing!). They also got to try out all of the hanging obstacles and grip strength obstacles that only the Finalists got to compete at just moments before. So while I ran around talking to people flying above many of us were these ANW-bound athletes testing where their fitness is at this moment in time. It was like one continuous line of athletes and a slew of "you got this! you got this! Pull up! Yeah! Body forward!" and other encouraging support for each other. It was a glorious opportunity to try the more difficult obstacles in an environment that was conducive. The staff was cool to be on hand and other ninjas to ensure safety was provided. The support for each other was the biggest thing I enjoyed from that display. From people being timed, to others working at spotting buddies to advice to those who never cleared certain obstacles from veterans who had the technique down. It was a clinic! I was meandering about after the competition and I saw a lot of wonderful things. The kids were practically in Disneyland since they were there able to see, hear and touch their favorite competitors. Geoff in particular was one that was asked a lot for his autograph. He took the time to know everyone's name and talk to them for a bit. This one came up with a printed photo of Geoff clearing the Final Stage in ANW7 and Geoff happily signed it and talked to the boy to know who he was. It was really touching to see. It's always also nice to be able to meet your heroes and leave with an extremely positive experience. That's so rare these days that I had to document this one. Those kids were lucky that everyone in the gym that day were so generous with their time and took care of the kids who looked up to them. They were so lucky to be able to take selfies and get autographs and each of the ninjas were really open to doing that even if they were previously eliminated. It was such a positive experience both days. I think the majority of the time I kept up with these two amazing goofballs! It's weird. We've known each other for years but met for the first time. It was like meeting someone you haven't seen in years! It was wonderful talking about the history of not just their journey through this world but also Sasuke and American Ninja Challenge and even some nice words about G4TV! Yeah.. you know it's bad when you think of G4TV fondly! LOL!!!!! They are amazing and passionate guys about the same stuff I'm passionate about. They were both exhausted having traveled so far just to be here. Strat was still nursing that recent surgery so he was just here to root on Bret Sims, Grace Jones and Mike Bernardo for the weekend. I'm sad to say I totally missed meeting Grace! For those who aren't familiar with that history.. this screenshot was from Sasuke 26 back in 2011. This was the last time you ever saw it. I .. honestly miss it. I wish it returned. William was working hard this weekend as well running around getting interviews and documenting the tournament in full. Thanks again (I know I keep saying this) for EVERYONE who helped support the both of us by agreeing to interviews and photos. We REALLY appreciate it. Everyone was sooooo nice! Thanks to Michelle in particular who was sick as a dog and still was gracious and friendly with everyone. It was so nice to finally meet her after talking about her from way back in the Sasuke ASEAN Open Cup! It was an amazing weekend and I look forward to getting the reports up on the blog. Please be patient as this week will be brutal with all of the projects I talked about in the previous update.